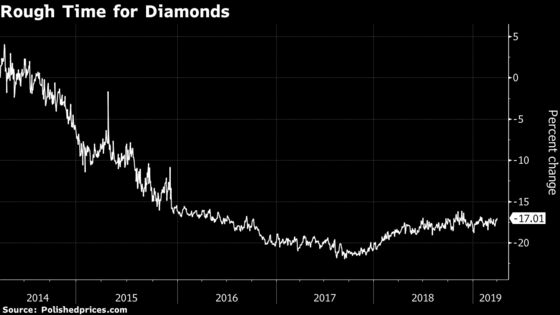 (Bloomberg) -- The U.K.’s financial regulator added a small diamond pricing firm to its roster of companies managing market benchmarks, opening the way to making the precious stones a more investable asset. The Financial Conduct Authority has authorized U2 Diamond Prices Ltd. as a benchmark administrator, joining firms such as FTSE International Ltd. and ICE Benchmark Administration Ltd. The move will allow financial institutions to offer products that reference its pricing. There have been attempts create diamond investment vehicles stretching back to at least the 1980s, when Thomson McKinnon Securities Inc. introduced a product. The company folded after the 1987 stock market crash. Since then, multiple companies have launched various products, with few gaining traction. Diamond Circle Capital Plc was the first publicly listed fund to invest in the gemstones, but shuttered in 2012. One hope for the industry is that creating a physically backed diamond product could spur new demand for polished diamonds and help reverse a slide in prices that has gone on for years. The polished diamond industry is worth about $25 billion a year.